South Korean marines march during a military exercise as a part of the annual joint military training called Foal Eagle between South Korea and the U.S. in Pohang, South Korea, April 5, 2018. North Korean threats to step away from denuclearlization talks are not slowing down planned military exercises between the United States and South Korea. 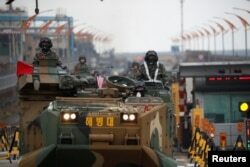 Pentagon officials reiterated Wednesday that the exercises, Max Thunder and Foal Eagle, part of annual spring exercises that date back 40 years, are proceeding as planned. North Korea in the past has objected to the U.S.-South Korea exercises as "rehearsals for invasion." The U.S. and South Korea maintain that the annual exercises are strictly defensive and non-provocative. "These defensive exercises are part of the ROK-U.S. Alliance's routine, annual training to maintain a foundation of military readiness," a Defense Department spokesman, Colonel Rob Manning, said in a statement issued late Tuesday. "While we will not discuss specifics, the defensive nature of these combined exercises has been clear for many decades and has not changed." A fighter jet takes off from an air base in Gwangju, South Korea, May 16, 2018. North Korea's official KCNA news agency said early Wednesday that Pyongyang had pulled out of scheduled talks with Seoul, citing the military exercises. It also quoted North Korea's first vice minister of foreign affairs as saying a planned summit between Kim Jong Un and U.S. President Donald Trump could be canceled, "if the U.S. is trying to drive us into a corner to force our unilateral nuclear abandonment." U.S. defense officials said the joint exercise with South Koreas air force, termed Max Thunder, began on May 14 and is set to run through May 25. The annual exercise, which itself has been held for the past 10 years, is run out of Gwangju Air Base. Like last year's exercise, about 1,000 U.S. personnel are taking part, and will fly hundreds of combat training missions. "During Max Thunder, U.S. and #ROK aircrews have the ability to fly missions in realistic scenarios," according to a Pentagon spokesperson. "This type of training is integral to our ability to safeguard the Korean Peninsula together." U.S. officials also denied reports that Washington and Seoul had scrapped plans to deploy B-52 bombers as part of the exercises. They said the long-range heavy bomber was never scheduled to take part in Max Thunder. Amphibious assault vehicles of the South Korean Marine Corps travel during a military exercise as a part of the annual joint military training called Foal Eagle between South Korea and the U.S. in Pohang, South Korea, April 5, 2018. A separate U.S.-South Korean military exercise, Foal Eagle, began in April and is expected to run until about June. U.S. and South Korean officials said Pyongyang was notified of the schedule and defensive nature of the exercises in March. Foal Eagle involves a series of ground, air, naval and special operator field exercises, with personnel moving in and out as needed. Officials have said Foal Eagle would be conducted on a similar scale to last year's exercise, when almost 32,000 U.S. troops, including 28,000 already stationed on the Korean Peninsula, took part.